Alta Access installs debris containment netting in a wide variety of situations. We have installed netting horizontally to catch falling debris under a ceiling, skylight or bridge or wrapped tightly as a temporary stabilization technique for building façades. Debris containment netting is either installed after a material failure, or preemptively when an inspection has revealed an imminent systemic failure. Among others, application locations may include: building façades, steeples, piers, bridges, trusses, roofs, ceilings, and stadiumsAlta Access installs stainless steel strapping or cables as required to temporarily hold displaced or cracked masonry units in place, allowing for time to develop permanent repair strategies. All installations meet OSHA regulation 1926.502(c) for safety netting and materials and meet ANSI A10.11 standards. To better enable access and ensure the safety of workers now and in the future for maintenance and repair of the built environment, Alta Access works with engineers on fall protection systems, lifelines, and other permanent or temporary installations. Work position netting (WPN) is a taut net and webbing matrix installed beneath structures and can be walked on and worked from. 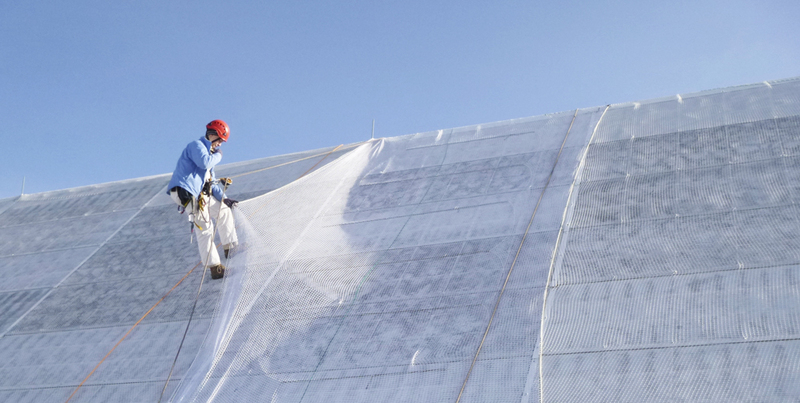 In situations where scaffolding is impractical, such as during work on bridges over water, stadium ceilings or where scaffolding presents a security risk and safety liability, WPN is a good alternative and Alta Access is uniquely qualified to perform work position netting installations. Unstable masonry may pose a risk to pedestrians and occupants and is often in hard-to-reach locations. Using rope access, Alta Access can remove loose or unsecured masonry in a safe, controlled manner. Using rope access, Alta Access makes light repairs on brick, stone masonry, terra cotta and other types of materials. Repairs include waterproofing, anchoring/reinforcing and repointing. Alta Access also uses industrial rope access for painting and caulking in extreme locations.